We have a wide selection of marble shower tiles and vanity tops in stock. Since 1993, Winsupply Jasper has been providing the Jasper, IN area with high-grade plumbing, electrical and HVAC supplies. We take pride in helping homeowners and contractors choose the best solutions for all their project needs. From plumbing fixtures to HVAC accessories, we guarantee we’ll have exactly what you’re looking for. Stop in to Winsupply Jasper today and let our friendly and knowledgeable staff show you everything we have to offer! Our business has more than 25 years of experience that sets us apart from our competition. We carry a wide variety of products, including electrical fittings, plumbing fixtures and septic system supplies. We guarantee you’ll find exactly what you need. Although our main clients are contractors and small business owners, we are happy to help you with any project you may be working on! We offer products from many different brands, such as Gerber, Bryant, Cooper Lighting and Champion Heating and Cooling. We take pride in our quick turnaround and delivery time. Winsupply Jasper specializes in wholesale electrical supply in Jasper, IN. From electrical outlets to transformers, we carry a wide variety of different electrical products. Need help finishing your plumbing project? We offer a wide variety of wholesale plumbing supply in Jasper, IN, too. We carry valves, piping and irrigation systems from top brands such as Delta, Moen and Charlotte Pipe and Foundry Company. Is your current heating, ventilation and air conditioning system not meeting your standard of living? 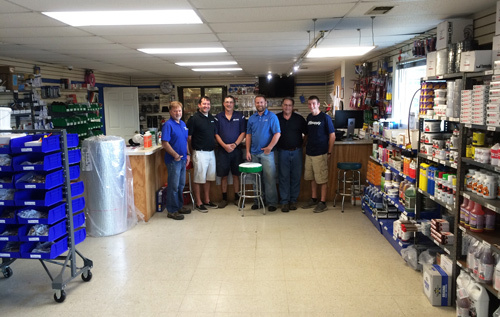 We sell wholesale HVAC systems and supplies at our store in Jasper, IN. HVAC is an important part of all residential and commercial structures, including family homes, hotels, restaurants and office buildings. Improve your current HVAC system or supplies with us! We’ll provide you with whatever you need to enhance your HVAC. Our friendly and knowledgeable staff is available during business hours to help and provide you with all the plumbing, electrical and HVAC supplies you need. Our products are offered at competitive prices to make sure you won’t break the bank to finish your project. Can’t make it to our store? No problem. Let us know what you need and we’ll deliver your supplies to your doorstep or project place in a timely manner each and every time. Let Us Help You Complete Your Project! Contact us at 812-634-2656 or visit us in store today! We look forward to providing you with whatever you may need. Our experienced staff members are your plumbing, electrical or HVAC experts.